Well. I really haven’t posted much the last week or so and this space has been awfully quiet. I hope you all have had wonderful, happy holidays thus far and that you are feeling ready for the new year to begin. Admittedly I’ve been in my own head quite a bit lately and I’ve felt a little challenged in coming out of my shell. I’ve vowed to make the effort today though, so here I am! This year’s holiday has been new territory for me. The kids have kind of hit that point where they are decidedly older. They relished being in charge of decorating the tree. I merely supervised the cookie baking as they proudly showed off their kitchen prowess. And for the actual holiday, they don’t really do toys as much anymore. The most exciting gifts were video games, books, and a super basic phone (and by basic, I mean very inexpensive and with zero bells & whistles) supplemented with new clothes which were a necessity cleverly disguised as gifts. On the heels of our trial run for our empty nest earlier in the month and leading up to another birthday for me, it felt like the Earth’s axis shifted in my little world and my normal pace was interrupted as it was kind of a lot for this lady to process. In the squinty, barely there lamplight of just before bed or just after having woken up. A little 50/50 yak/silk that showed up yesterday from Classy Squid Fiber Co. And yes, as my husband astutely pointed out, I began this less than 12 hours after I declared I would hold on starting any new spinning projects until the new year. In my defense, I got this to go with a batt a friend sent me that I really want to spin and I started with this because I have a little more of this braid than the batt so I could afford the learning curve of readjusting to the light-weight spinning I’d envisioned for the singles of this spin. And I really want to get to that batt. So I should probably do my photography and vacuuming before I touch it because getting my hands on it will surely be a slippery slope of just not moving for a good long while. But we’ll see how that goes. Because I know you all love Moose. 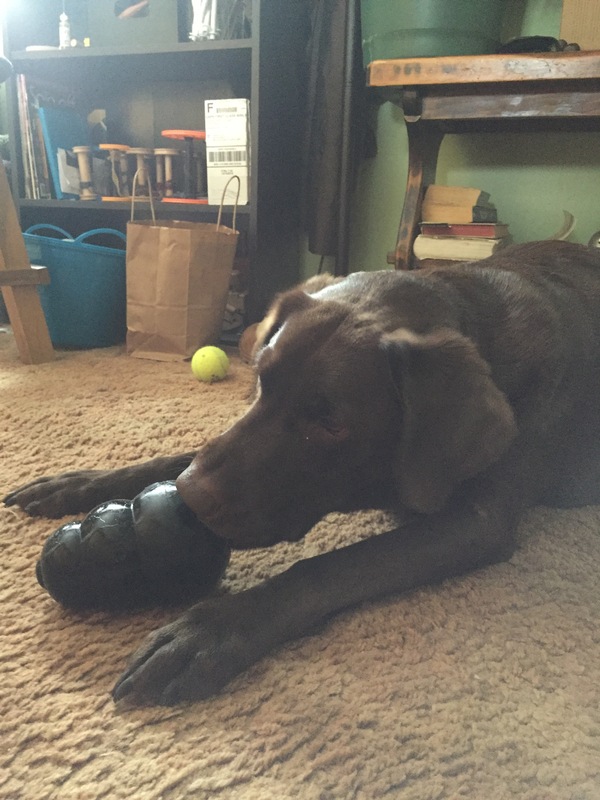 My in-laws got him a giant, power chewer Kong for Christmas. It’s ridiculously large and he loves it a whole lot. Sometimes he chews on it, but mostly he picks it up, proudly prances around with it and then throws it, waiting to see if ham will magically come out of it (because it has happened exactly twice since he got it). Who can blame him for being hopeful? Ham is pretty amazing. And with that, I am off to get spinning… I mean to take photographs and vacuum. My chocolate lab does those things too! Prancing and throwing his kong around. So cute! It sounds like it was a time of reflection for you, and just observing the changes and what they mean to you. I feel pretty sure you will figure out a way to adjust and it will involve spinning and knitting. 🙂 And weaving. As regards empty nest – just saw my niece-in-law a few weeks ago, and she was saying how much they enjoyed their “new” life now that the second child joined the first at college far far away. She thinks all the talk of empty nest being bad is a hoax put out there by parents who feel guilty at feeling so good about the freedom. So I leave you with that positive thought. 🙂 Now go finish taking those photos and get on with your spinning. 🙂 (who cares about vacuuming?) Give Moose some ham from me! Can you believe I did not take photos yet? But I did do a bunch of spinning, start a sock, and vacuumed. LOL! I agree with salpal1 – vacuum? Heck no! It can wait! 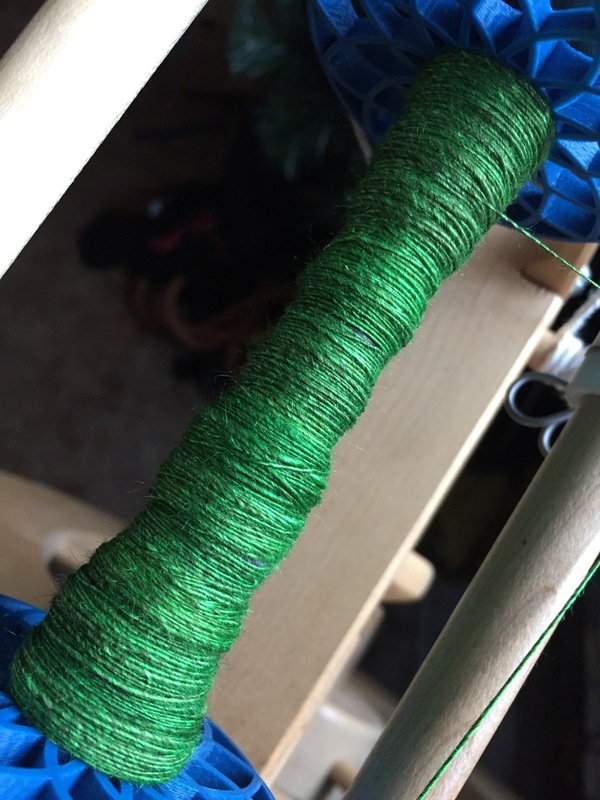 That green you’re spinning just looks like spring – such a happy color! Yes, and give Moose ham for me too. We had a toy poodle years ago who had a smaller version of the same toy. It was his favorite too and he’d run us ragged, throwing and retrieving. Nice memory. Glad you had a swell Christmas and birthday! Yes! It’s been kind of a blah winter her thus far, the back and forth between relatively warm temps and cold ones has been weird and I think I just needed a change. 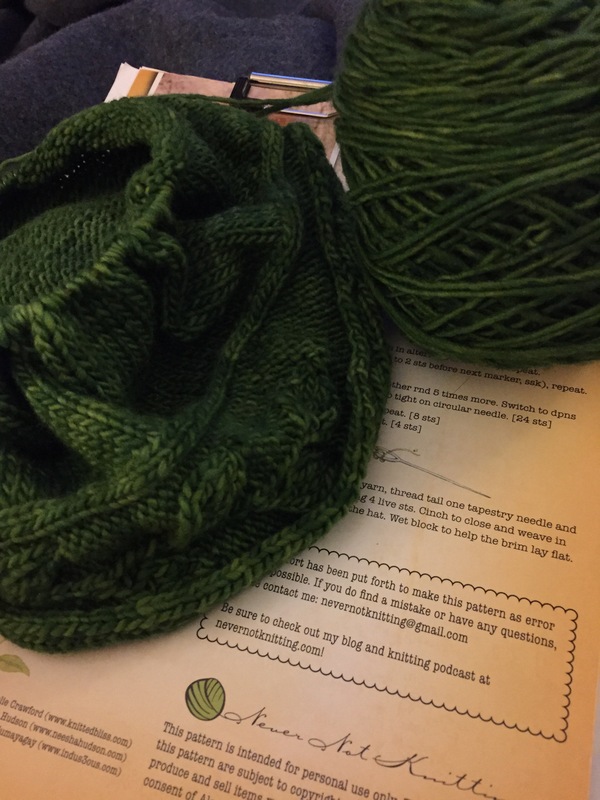 The green (and in yak+silk) was just what I needed!